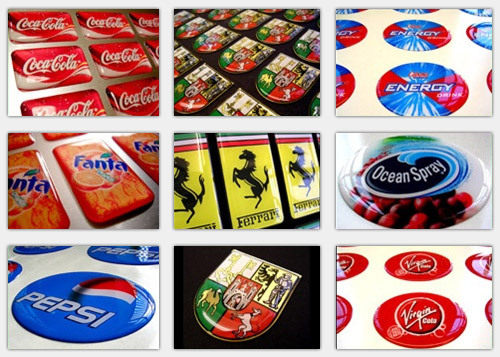 For domed stickers we offer a wide choice of 6 different vinyls. Vinyl is the name given to the sticker material that we print your design on to. Each vinyl type has its own unique properties, and we don’t charge extra for metallic domed stickers! For more information on the different vinyls, please see the ‘Metallic Options’ tab above. 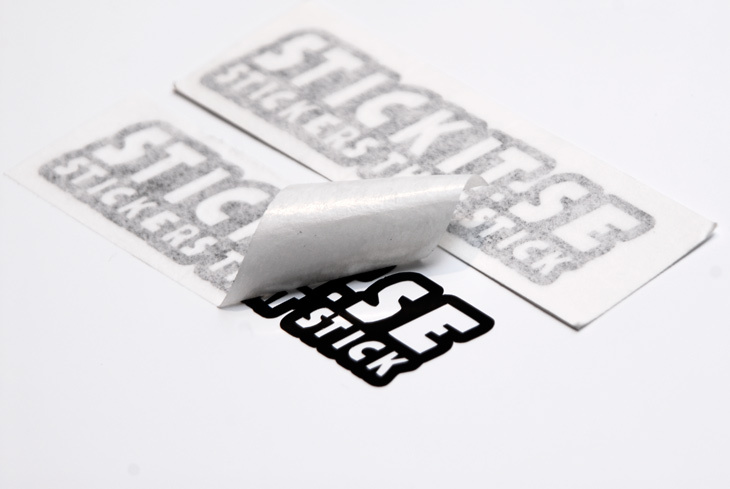 Our domed stickers are available in almost any shape you can think of. On our website you can choose from: Rectangle, Square, Circle and Oval. Once you have chosen your shape you will have full control of the width, height and corner radius (if applicable) to tailor it to your requirements. 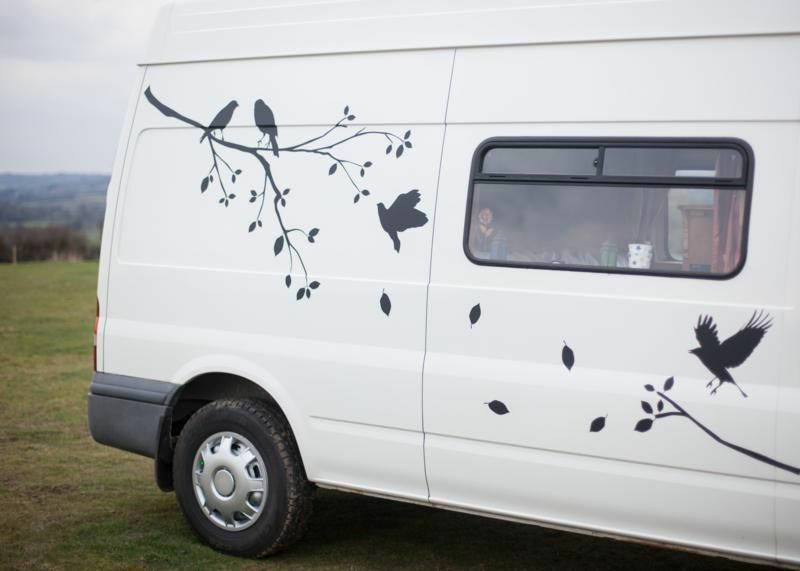 Clear Vinyl By default, when printing onto clear vinyl, we print a layer of white ink beneath the non-white parts of the design to increase opacity. You can turn off “White Ink” when ordering your clear vinyl sticker if you’d prefer semi-transparent colours, but this is not recommended. 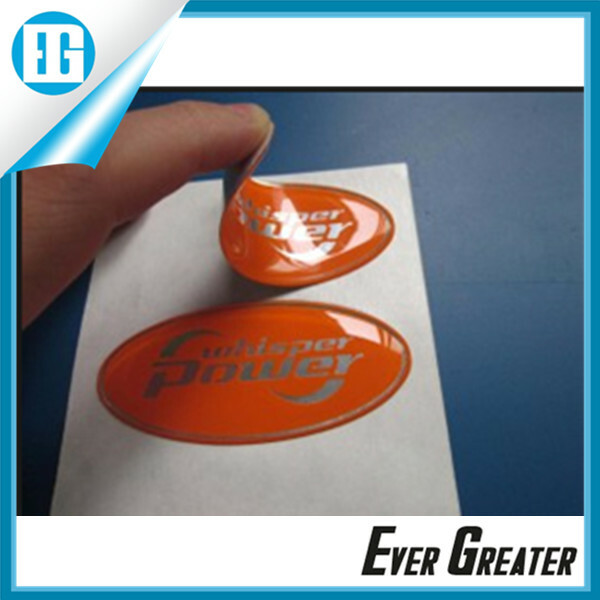 Polyurethane Doming Resin Our domed stickers are coated with a scratch-proof polyurethane epoxy resin. Not only is the plastic coating scratch-proof, but it also protects the sticker from the sun’s harmful UV rays. This protection helps to keep your logo looking bright and fade-free, preserving each of your design’s vibrant colours for years of faithful service. Frequently Asked Questions for Domed stickers What is this product exactly? And what can I use it for? 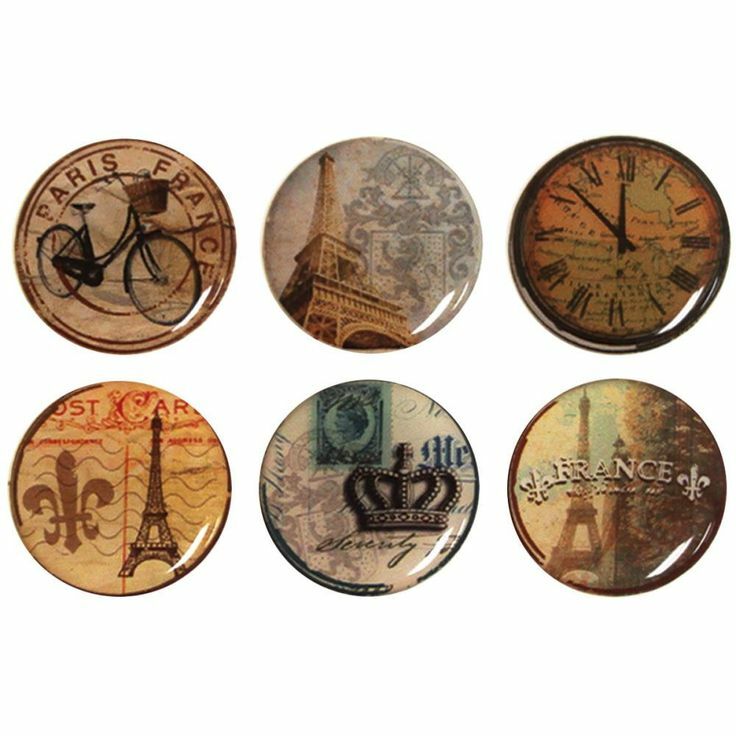 domed stickers are stickers with a permanent adhesive layer printed on a 80 grams vinyl material with on top of that a transparant gel. Because of this gel it has a 3d effect and it will be scratchproof. 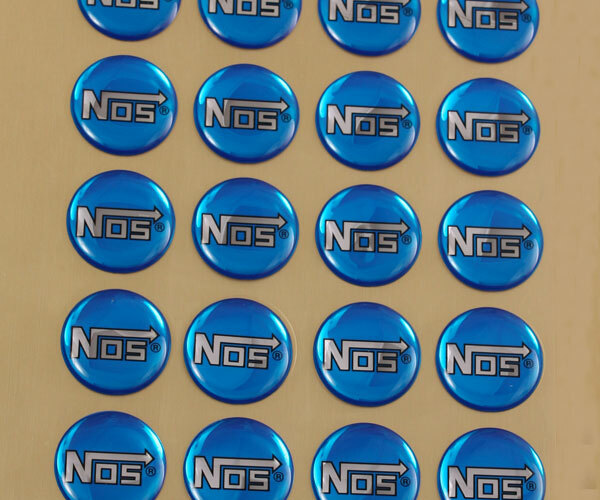 These stickers are often used close to where the product is been sold, so the logo is visible for the customer. In-store hangers for example or next to sales counter. 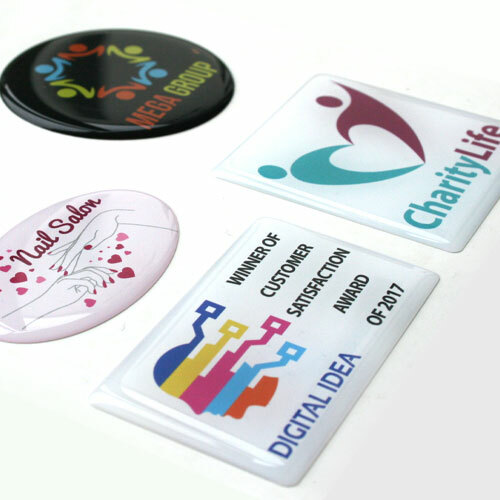 They are also used as promotional material for events or as a customer gift. Which carriers are used for the delivery? 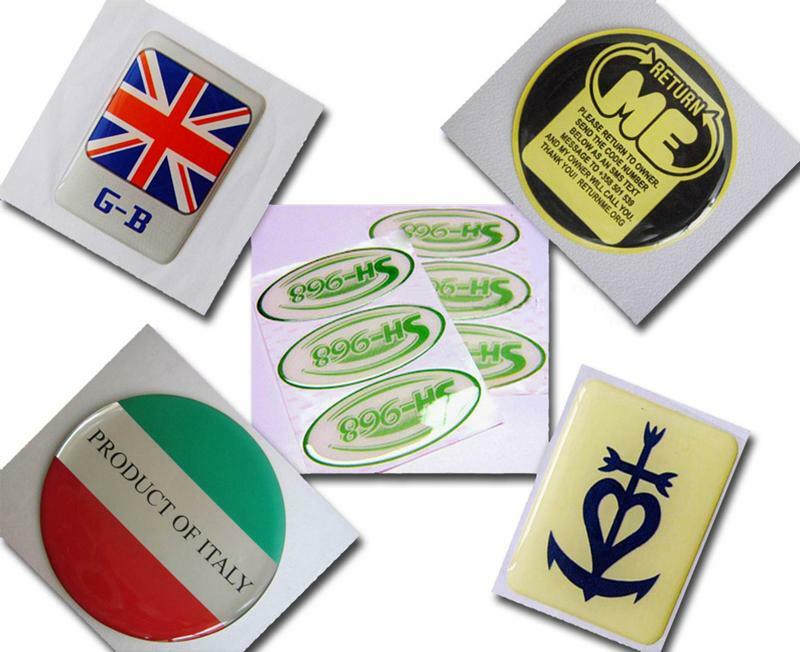 For the delivery of your Domed stickers we use multiple carriers. Because of the highest reliability, in most cases we use: UPS and DPD. UPS Other carriers we use are DHL and even our own courier service. These carriers are used for certain products (depending on the size, the turnaround and the quantity) Are Domed stickers fit for usage outside? Our doming stickers are automotive quality, this means they can endure extreme weather conditions. So yes, they can be used for outdoor/indoor purposes. How will my logo look like with the doming effect? In most cases the colours which are on your design will not be altered because of the doming effect, the transparant gel. The gel itself is transparant with a small touch of yellow, this will not be visisble for the eye but in case of grey f.e. it might cause a slight difference in perceived colour. In direct sunlight the reflection within the sticker might cause a slight glow. If you would like to specify a custom shape or have the sticker / label contour-cut around the edge of your design / logo, you have two options:1) Customers with print-ready files made to the specifications on our artwork page can choose “Custom” as the shape when ordering and upload the file(s) online. You can then add the product to your shopping cart and checkout online.2) Please email us, attach your logo/design and explain your requirements. Our graphic designers will be happy to put together a design for you to approve. Submitting your artwork is easy, simply follow these instructions when you design & upload the artwork for your domed stickers. Click on an instruction for more information. 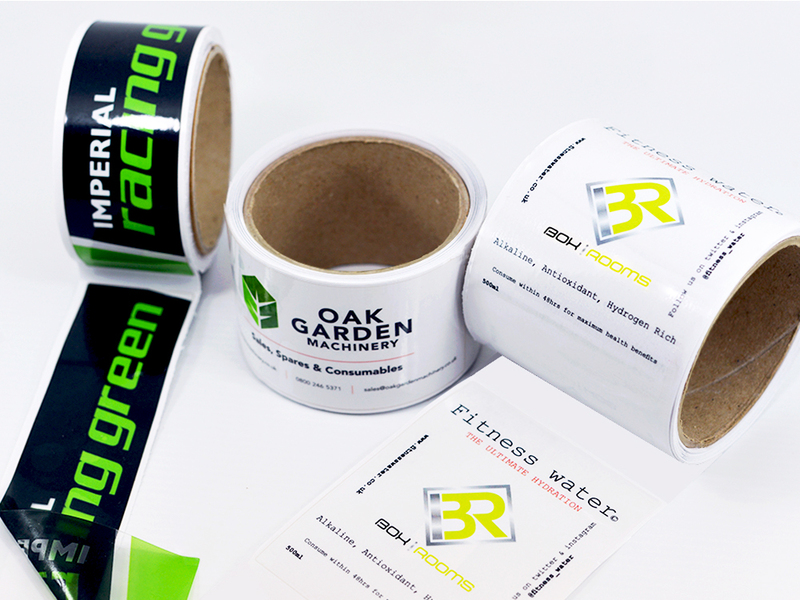 All of our custom domed stickers are supplied in an easy-to-peel sheet format, not on a roll. The sheets are usually A4 in size but this can vary depending on the size of sticker chosen and the quantity ordered. 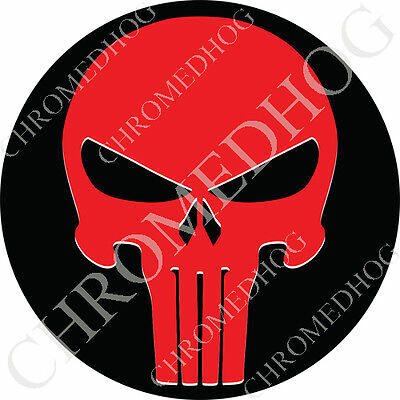 Submission specifications for Domed stickers Add 3 mm bleed. To allow leeway for cutting differences in production, always add a bleed of 3 mm around all edges of your design. Make sure colours, background pictures and layouts extend into the bleed area so as to avoid leaving white lines as a result of cutting tolerances. 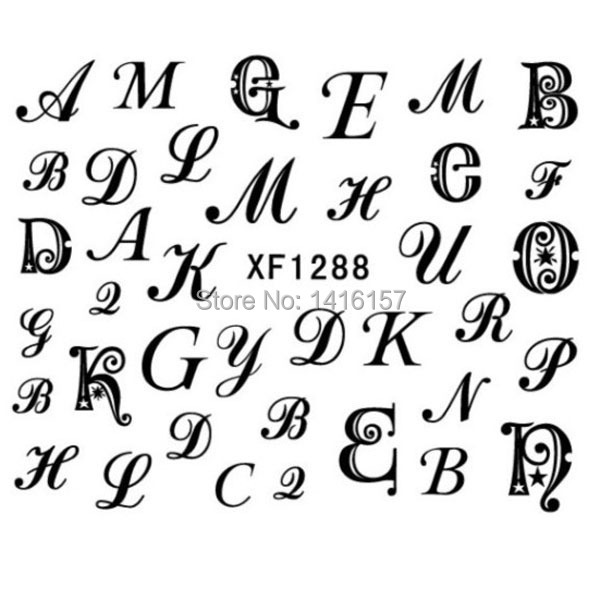 You can submit your file with crop marks and printer’s marks. White will not be printed. White colors in your design will not be printed. All objects in your design that are white, will have the color of the material on the final result. Resolution of at least 300 dpi. Make sure the resolution of the images and graphics in your artwork are at least 300 dpi. Convert fonts to outlines or embed all the fonts. 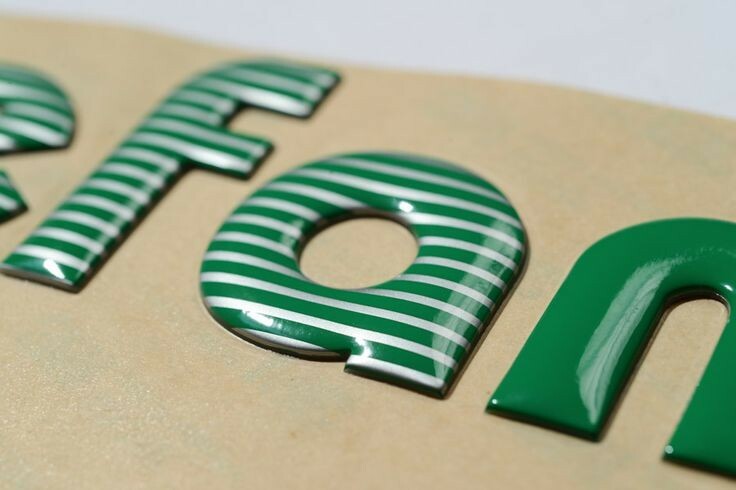 Make sure you convert fonts to outlines or embed all the fonts when saving it to PDF. Make sure the ink coverage isn’t higher than 300%. Force Color Images to CMYK with a 260% ink limit (in Photoshop > Convert Color Profile > Photoshop 5 Default CMYK). Make sure the ink coverage isn’t higher than 300%. Fonts should be at least 6pt. Fonts should be at least 6 pt. Use the right values for full color black. Use Rich Black (C:63% M:52% Y:51% K:100%) for larger areas and text to get a deep black color. Do not use this value for text smaller than 15 pt or plain text. This can only be used in full color printing. For designing black smaller texts use 100% black. Lines should be at least 0.25 pt. Lines should be at least 0.25 pt. Negative lines should be at least 0. 5 pt. Check your artwork on overprint. Make sure no elements in your artwork are set on overprint. Unless you want this effect in your design. The degree of transparency in printing depends on the ink, paper, and printing method used. 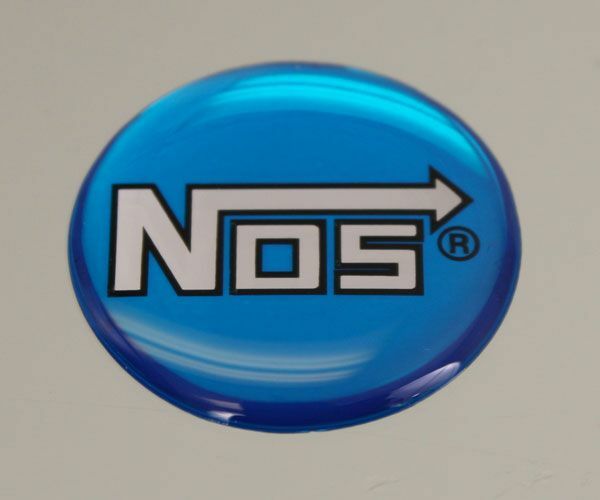 All of our domed stickers are domed with a scratch-proof epoxy resin. Not only is the resin coating scratch-proof, but it also provides protection from the sun’s harmful UV rays. This protection helps to keep your logo looking bright and fade-free, preserving each of your design’s vibrant colours for years of faithful service. In order to design the perfect artwork for your domed stickers, we have created some easy templates. You will find the most popular artwork templates below. Click on the link at the bottom to see all templates. Please Note For custom shape designs ordered via email we may have to alter your design if it is not feasible to be domed, such as if it contains pointed edges or tight internal radiuses. Corners must be rounded and need to have a minimum radius of around 1mm. 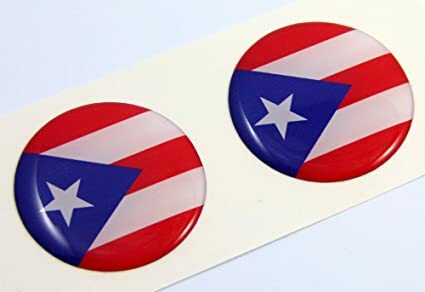 Non-standard shaped stickers that require intricate doming like stars, donut rings or text may be subject to extra charges – please contact us to discuss your requirements. All email orders will be given a PDF proof before production which will show any of these changes. Orders placed on the website will be approved as part of the ordering process. White Ink For more information about printing white ink, please see our white ink page.